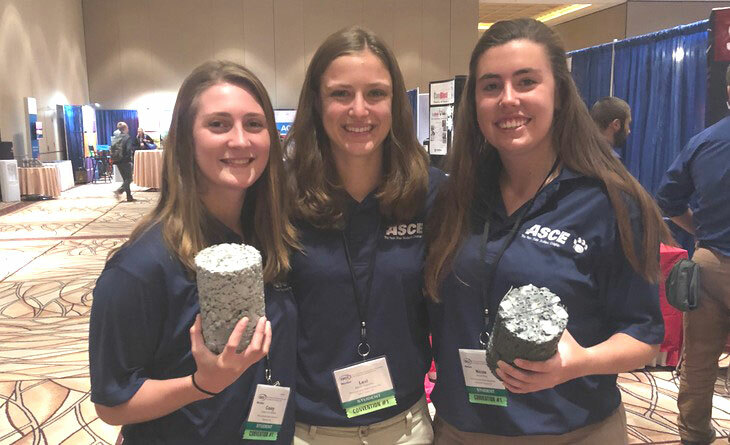 University Park, Pa. — Penn State’s student chapter of the American Concrete Institute (ACI) has not only been restarted following several semesters of hiatus, but it is also being spearheaded by its first-ever all-female leadership team. The Penn State chapter of ACI strives to expose its members to the field of concrete engineering, including the studies of structural engineering and materials science, in coordination with the American Concrete Institute. In addition, they help prepare members for employment and advanced educational opportunities in the field of concrete engineering. The new executive members include Nicole Dato, president; Lexi Gawelko, vice president; and Casey Mrazik, treasurer. Aleksandra Radlinska, assistant professor of civil engineering, is the adviser to the club, as well as a Fellow of ACI. The women, who lead approximately 25 other members, are dedicated to helping students succeed within the civil engineering field. However, their work with ACI will not be limited to the Penn State, University Park campus. This October, the leaders traveled to the the ACI Fall 2018 – Dream Big, Build Bigger convention Oct. 14-18, in Las Vegas, where they networked with other student chapters to gain more insight on how to run a successful organization. While there, they also participated in the Pervious Concrete Cylinder Competition where they placed ninth out of 54 teams in tensile strength. The team placed 31 out of 54 overall. “For it being our first competition, and for competing against very established ACI student chapters, we are pleased with our results and look forward to improving in future competitions and future years,” Gawelko said. For the leadership team, moving forward and inspiring other women is at the forefront of their goals. “We are excited to be a part of the progression of women in engineering. We hope to be role models for women leaders that come after us,” Dato said. Penn State has had an ACI student chapter in the past, but in 2016, the club became inactive, prompting students to take action and recommit to building the ACI chapter. The reformation came shortly after all three leaders worked together on the Penn State Concrete Canoe Team, sponsored by the American Society of Civil Engineers, a competition where teams must successfully build and test canoes made from concrete. Overall, they just want to see the club thrive, whether that is through the ACI certification process or providing professional development. Their main goal is to continue their outreach to expand the club and prepare for upcoming events. Not only is the women’s involvement highlighted in their own efforts but also through the insight of their adviser.